I recently acquired a 1" corner chisel from my favorite roll-of-the-dice antiques dealer, eBay. This little fella had seen better days, but fortunately, the price reflected its poor condition. After removing the mangled "handle" and makeshift striking ring, the steel then took a quick bath in my favorite rust removal cocktail. 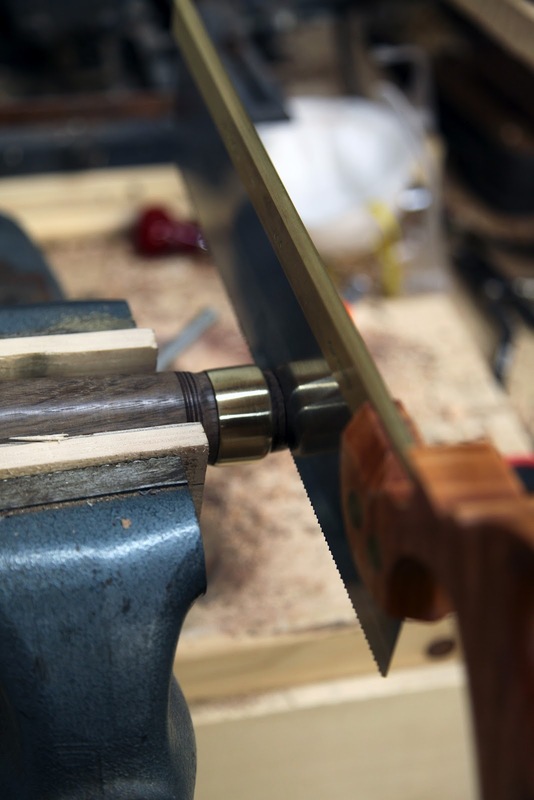 The chisel's business end cleaned up well, and I just happened to have a nice hunk of cocobolo in the handle pile. 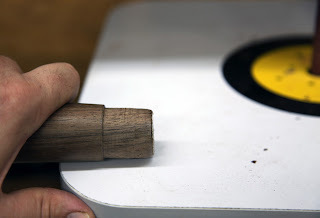 I chucked in the cocobolo and fired up the lathe. In about fifteen minutes, and after a little debating with myself, I had a rough handle shape and a mental picture of the final product. 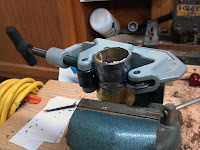 I had some brass set aside to make a new striking ring, however, as I cleaned off the little gargoyle that came with the chisel, I found out that it was a nice piece of solid brass. I cut the brass to size with a pipe cutter, which worked very well and chucked it into the South Bend to turn it true, bevel the edges, and polish it up. There are many ways to seat the ring onto a chisel handle, heat, compression, a pin, and brute force are just a few. I personally prefer to avoid the methods that use water to expand the fibers into the ring. This method works, initially. 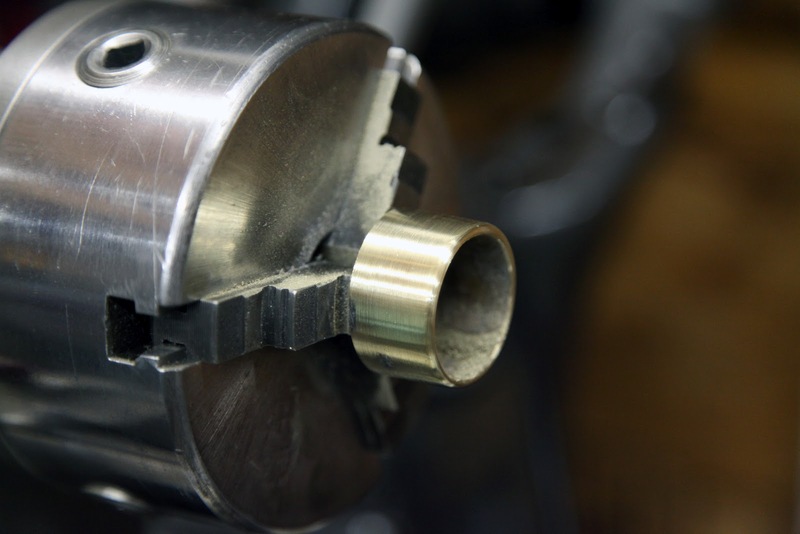 The problem with water is that it expands the compressed fibers appropriately, but when it dries it leaves the fibers hard, brittle and prone to excessive damage. 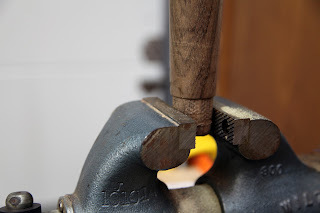 A method I like to use is to lightly compress the fibers with the vise (a delicate process) or a small hammer, seat the ring and then let the handle soak in a 1:10 mix of boiled linseed oil and turpentine to expand the fibers. The oil penetrates the wood grain with the turpentine just like the water causing the appropriate expansion, but, unlike the water the end grain remains pliable and well preserved from the oil when the turpentine evaporates, not to mention the beautiful finish it provides on the handle when combined with a little wax. 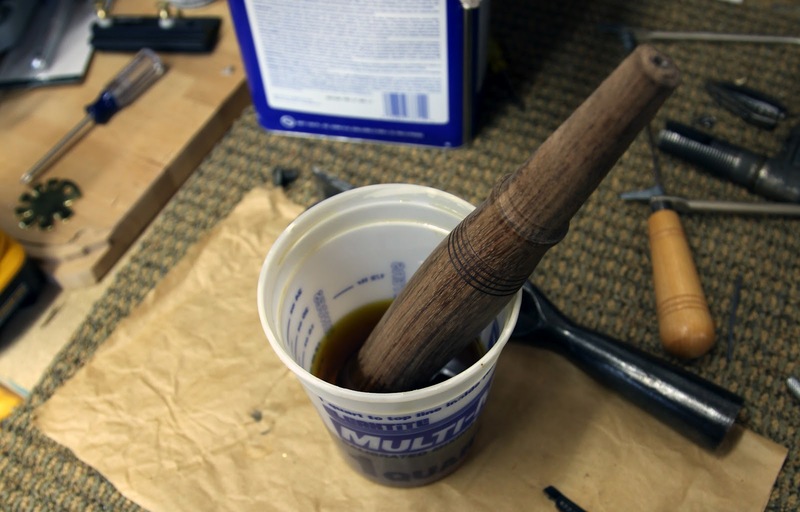 If you don't like the boiled linseed oil as a finish, it can be sanded off the exterior as there isn't much in the turpentine to start with. Once the ring is seated, but before I soak it away in the linseed oil, I re-chuck it in the lathe and make minor finishes to the surface of the handle, especially where the wood meets the ring. 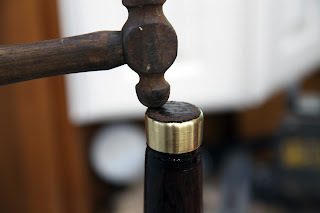 I then saw off the excess lumber on the end of the handle. 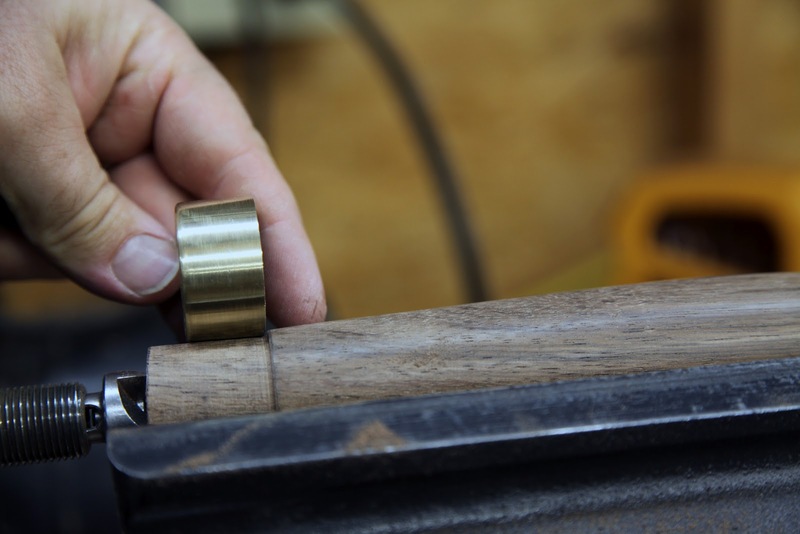 I try to leave anywhere between 2 and 4 mm on the end of the handle to allow the grain to spread into the striking ring once it is properly mashed into place. When the oil mixture seems to have soaked in appropriately (4 hours with this cocobolo) I wipe off the excess and seat the ring with a ball pein hammer or a hammer and a wide tipped nail set. 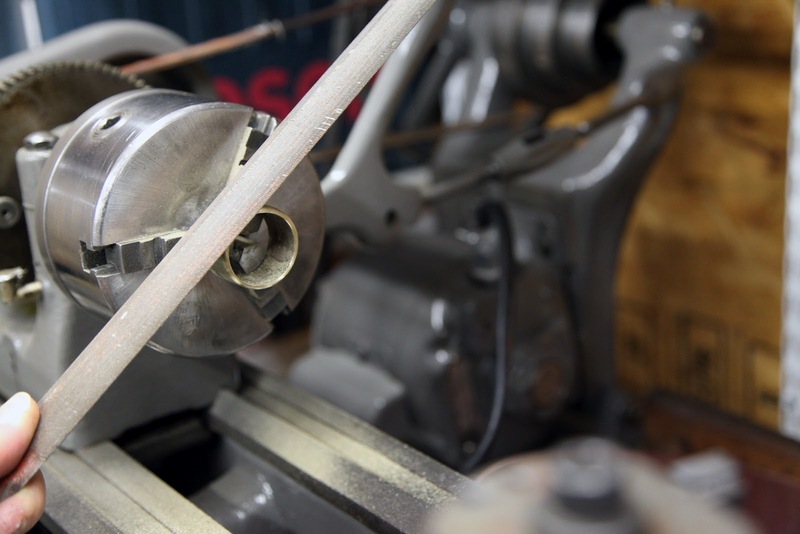 I use the hammer in a circular pattern starting in the middle of the handle and working my way outward to gently spread the fibers into the brass ring. 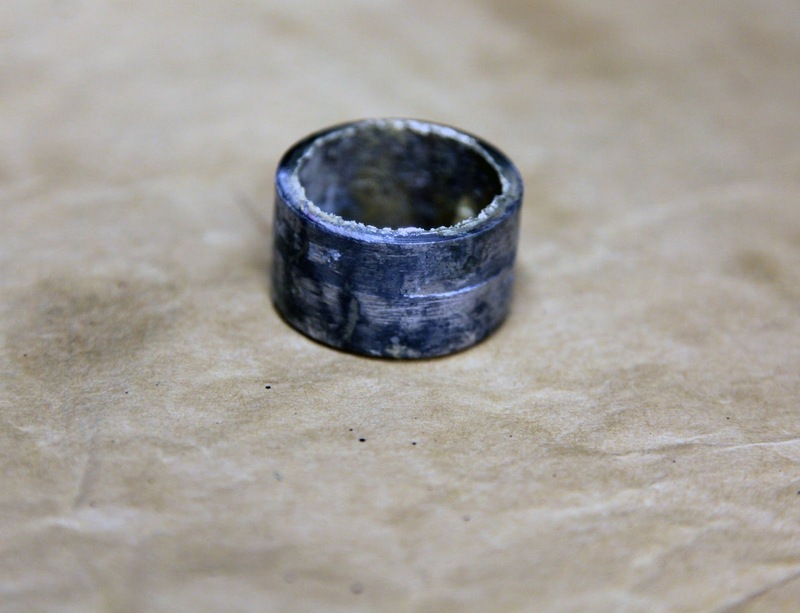 The next step is to reshape and sharpen the steel. That process will be another post, as corner chisels are a horse of a different color, plus I need more time to finish the whole process.